"418 T S T W Bela Lugosi"
Bela Lugosi was born Be’la Ferenc Dezso Blasko in Hungary. After a hearty beginning on the stage, he began his first film appearances during WWI. Forced to move to Germany in 1919, due to his organization of an actors union which was seen as too left wing for Hungary, he soon moved to the US and starred in his most memorable role. Dracula hit Broadway in 1927 and Hollywood in 1931. At the time, he barely spoke English, and learned all of his lines phonetically. After starring as the vampire Count, Lugosi was type-cast in his evil role, and was destined to replay Dracula-type roles countless times. Bela reportedly said, "I’ll be truthful. The weekly paycheck is the most important thing to me. 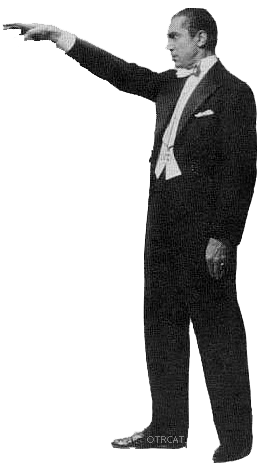 Hungry for any part in any movie, Lugosi’s reputation as a B-actor overtook him. Before acting in Ed "The Worst Director of All Time" Wood’s movies, Bela’s face was all over the front page for his morphine drug addition. He died a poor man (Frank Sinatra paid for his funeral), and was buried in his famous Dracula cape. This collection, however, includes radio programs from the 1930s and 1940s, at the height of Bela’s popularity including his appearance on Mystery House. 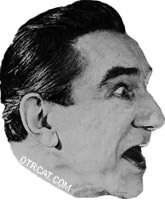 Also included in the collection are many amusing pictures of Bela, both in and out of his Dracula costume. This collection contains his guest apperances from the series, Candid Microphone, Command Performance, Fred Allen, Mystery House, Suspense and Texaco Star Theater. For more radio horror personalities, see also: Vincent Price, Boris Karloff, and Peter Lorre. See also: Vampires in Old Time Radio. I meant to thank you and compliment you earlier on the speed with which you sent my disks. So thank you for the speed with which you sent my disks. I am really enjoying them, too. he is still alive he is the "original" vampire..